Buckingham Churches: Maysville Presbyterian | slate river ramblings . . . . Yet another of the nineteen churches in Buckingham enumerated in Thomas Baldwin’s Gazetteer of the United States (1854) is Maysville Presbyterian Church. In 1822, Rev. John W. Fulton, licensed by Hanover Presbytery, was sent to Buckingham County to establish a church. Two years later, Rev. John Holt Rice, D.D. organized the new church with nine members. By 1830, the congregation had grown to thirty-nine. The church building pictured here was completed in 1838 and is beautifully maintained today. Closely resembling the Buckingham Courthouse, it is located in the town’s Historic District. As would be expected in Buckingham, its roof is made of slate. 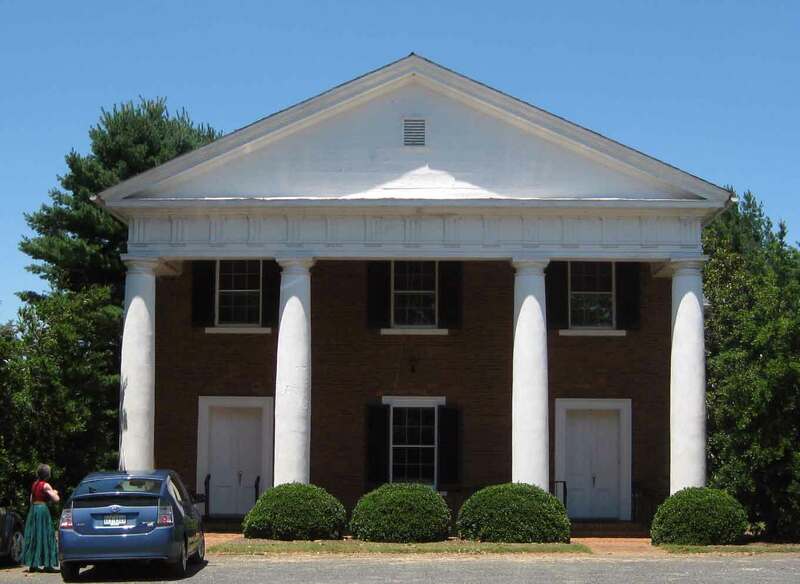 This is the church that I believe my great grandmother, Sallie Bett BRANCH attended as a child, in Buckingham County. Dr. Charles Edward Davidson, who was a member of my overall Davidson family, is buried in the cemetery of this Presbyterian church. He was an Assistant Surgeon for the Confederacy. In addition, he and Samuel L. Housewright wrote a letter to President Jefferson Davis where they offered the services of an unnamed British man who could bring arms into the country (for use by the Confederates). As I recall, Rice University has the original of that letter, but I believe that a copy can be found on the internet. Dr. Charles Edward Davidson was married to Eveline Parrack, and if you do an internet search for them, you can find a photograph of them that is for sale. Dr. Davidson was almost certainly (per a lot of research) a descendant of the David Davidson (married to a Mary Giles) who appeared on the 1764 Buckingham Co. VA tithe list. The Edward Davidson and the William Davidson, Senior who were also on that 1764 tithe list were probably brothers of that David Davidson, and all three of them had been on the tithe list in Goochland Co., VA in the mid-1740s. This Davidson family has been “traced back” to the David and/or William Davidson who both died in James City Co., VA in 1687. Bill, Thank you for this comment, especially the information about the letter from Dr. Charles Edward Davidson and Samuel L. Housewright. I have found a transcription of the letter and will make it the subject of future post. I also found the daguerreotype of Dr. Charles Edward Davidson and Eveline Parrack which is currently for sale, complete with its whopping price tag: $2,000.00. It is lovely. Buckingham County 1856: Maysville | slate river ramblings . . . .